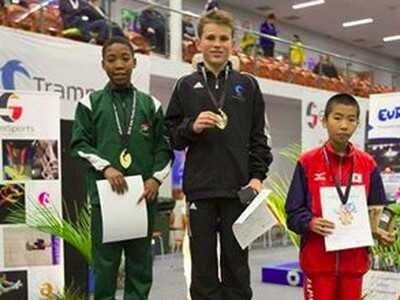 Our gymnasts collected an impressive set of National and International Championships medals. Click here to download the medals list. 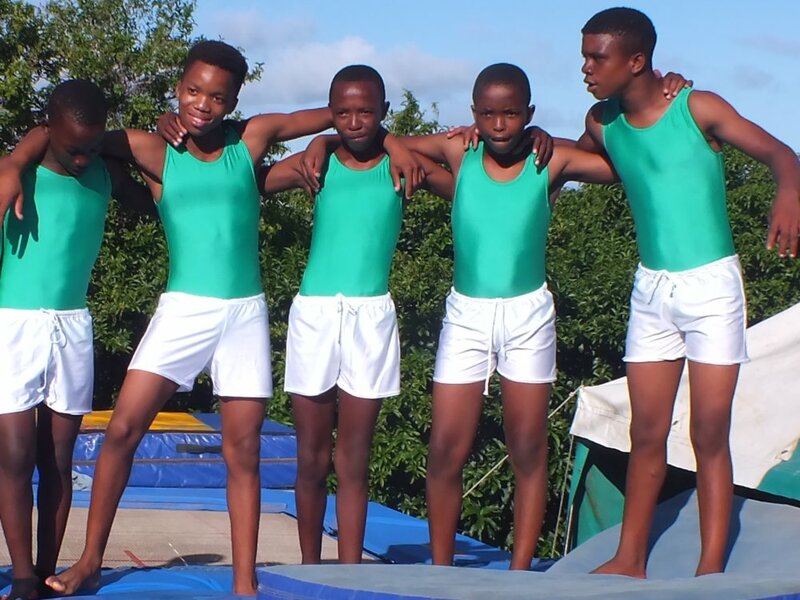 A record number of five Nemato gymnasts and their coach traveled overseas: Khanyile Mbolekwa, Liyema Nxobo, Onke Mangele, Siphamandla Baku, Siyabulela Siwa and coach Lee Butler. It was a trip all the way to New Zealand for the 2016 Indo Pacific Championships. 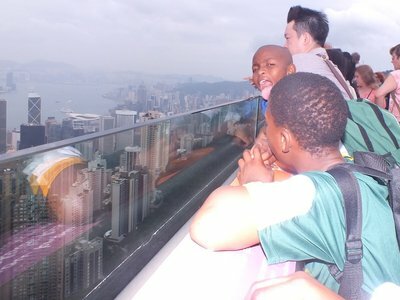 On the way the guys visited Hong Kong. 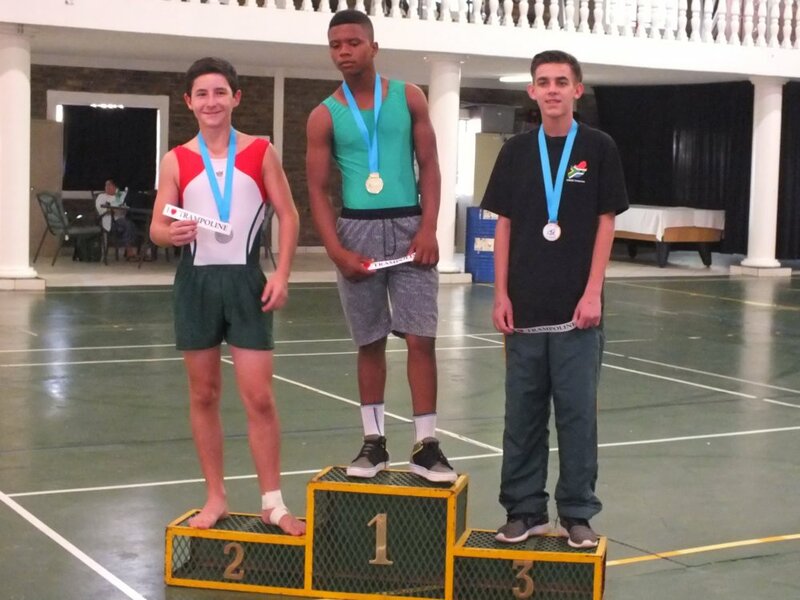 Of the South Africans competing, only Nemato gymnasts won medals: Onke got bronze on double mini trampoline in the age group 15-16 and Khanyile won gold on the same trampoline in the age group 11-12, beating some of the finalists at last years junior world champs! It was the first time a Nemato athlete participated in the Junior Commonwealth Games. It took place in Namibia. 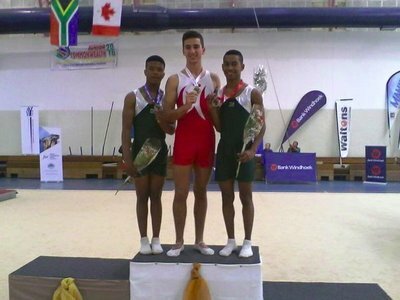 Onke Mangele won silver on the double mini trampoline behind Canada. The national championships for gymnastics took place in Cape Town this year. We participated with seven gymnasts. Onke Mangele won the double mini trampoline for the third year in a row. We had hope for one or two more gold championship medals, but that didn't work out. 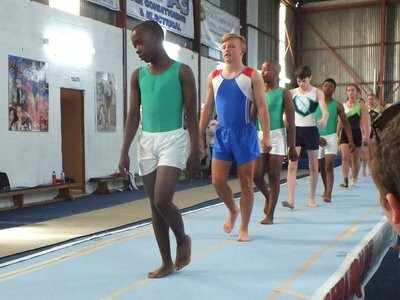 The Eastern Cape Academy of Sport (ECAS) offered our gymnasts a training camp in Port Elizabeth to prepare for the upcoming national championships and international competitions. 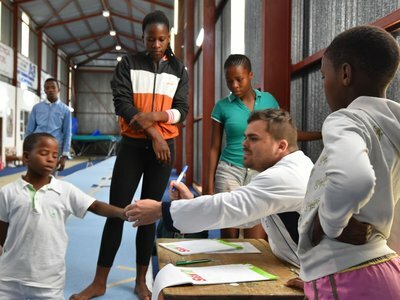 Injuries and the pressure of top level gymnastics are taking toll on some of our gymnasts, but we are hoping to come back with some medals from the top competitions. Many thanks to ECAS for making this camp possible! 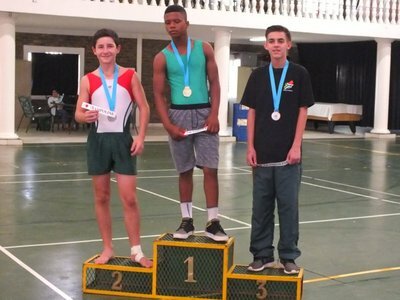 Onke Magele became African Junior Champion on the double mini trampoline in Namibia. It was the first time Nemato members went to a continental championships and we are very proud to have an African Champion in our gymnastics club! 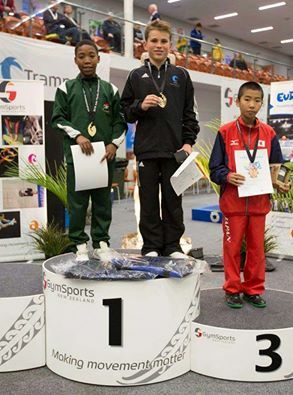 Onke also won the gold team medal on double mini trampoline and the bronze team medal on trampoline. 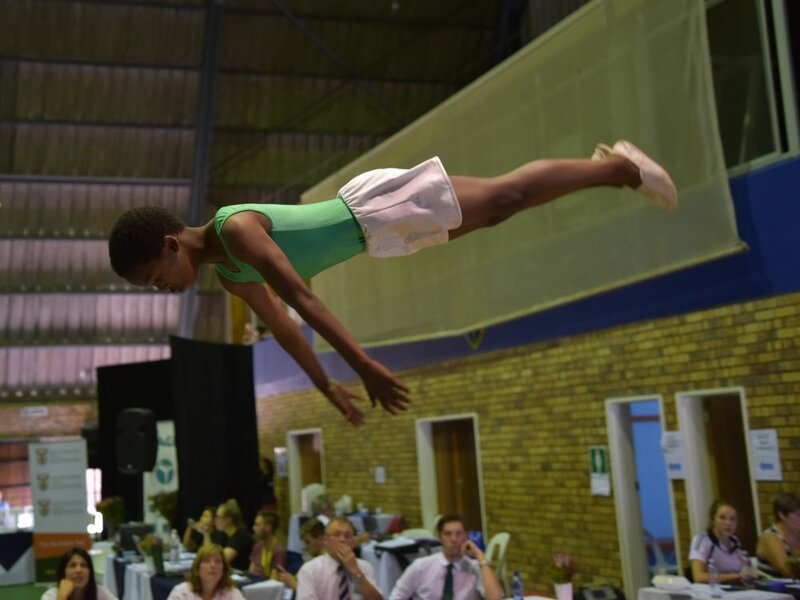 Siyabulela Siwa, who replaced injured Liyema Nxobo on trampoline, made it all the way to a sixth place in the finals and also won the bronze team medal on trampoline. 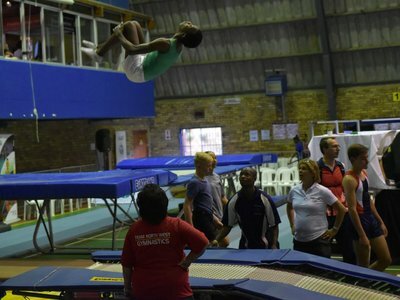 Siphamandla Baku participated on as senior on the double mini trampoline. The second Eastern Cape Trials were highly successful for Nemato. 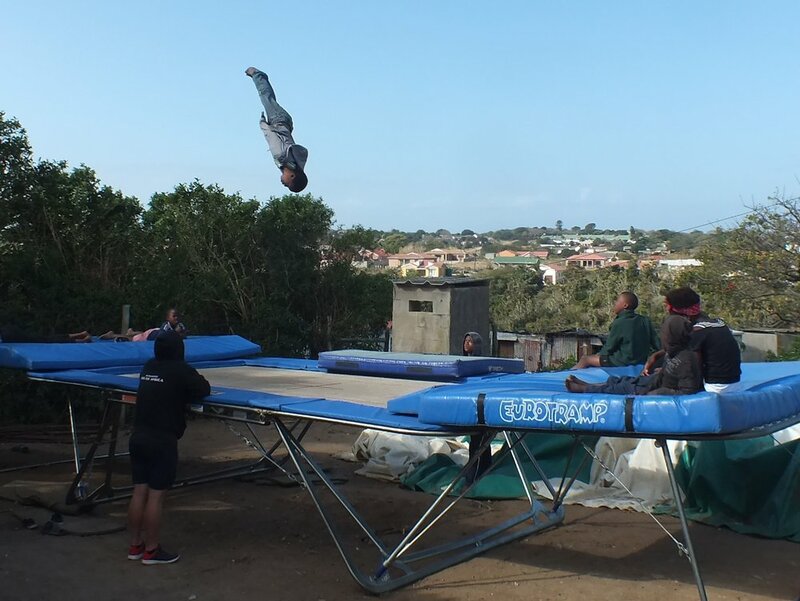 Our senior gymnast Siphamandla Baku was the only gymnast to jump a triffis mount (triple front flip with half turn) on the double mini trampoline. 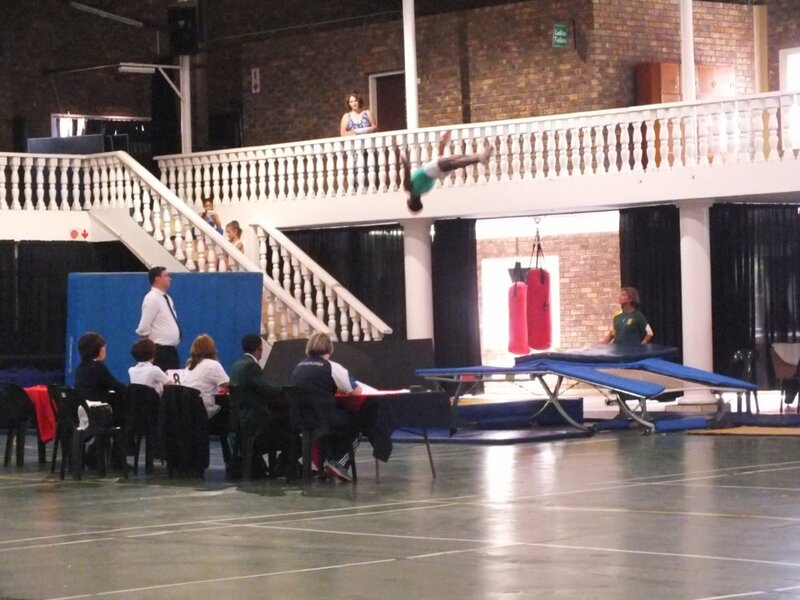 Onke Mangele, in the age group 15/16, finished an incredibly difficult trampoline routine starting with a triffis. Nobody in the province, not even the seniors, come anywhere close to his difficulty. 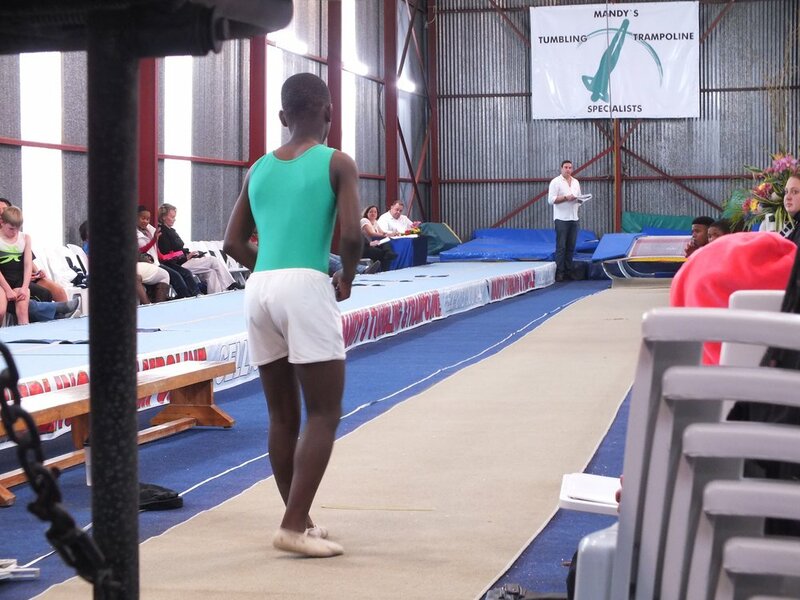 Liyema Nxobo, with lower difficulty, but high precision and no mistakes, won the trampoline and the double mini trampoline, showing his readiness for international competition. 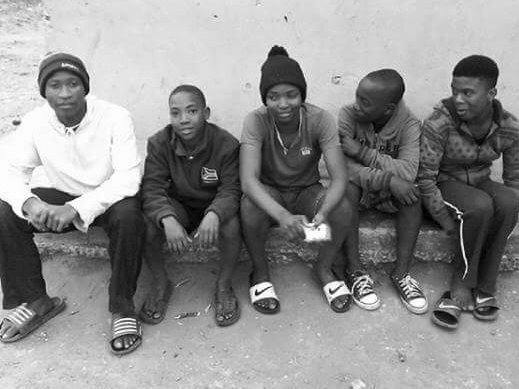 Siyabulela Siwa (13-14) and Khanyile Mbolebwa (11-12) are in their age groups far ahead in the province. Also our gymnasts who are not at international level did well and we expect most of them to qualify for national championships. 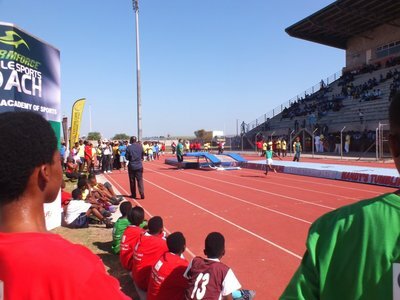 African Championships in Namibia in August/September: Liyema Nxobo, Onke Mangele and Siphamandla Baku. 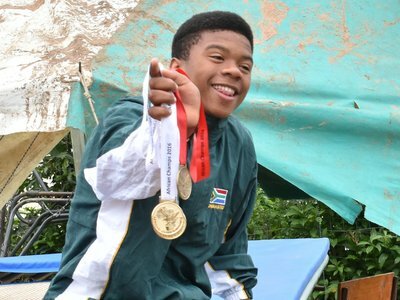 Youth Commonwealth Games in Namibia in October: Onke Mangele. Indo Pacific Championships in New Zealand in October: Khanyile Mbolebwa, Liyema Nxobo, Onke Mangele, Siphamandla Baku and Siyabulela Siwa. Our gymnastics coach Lee Budler from Port Elizabeth came for three days to Port Alfred to coach the Nemato gymnasts. 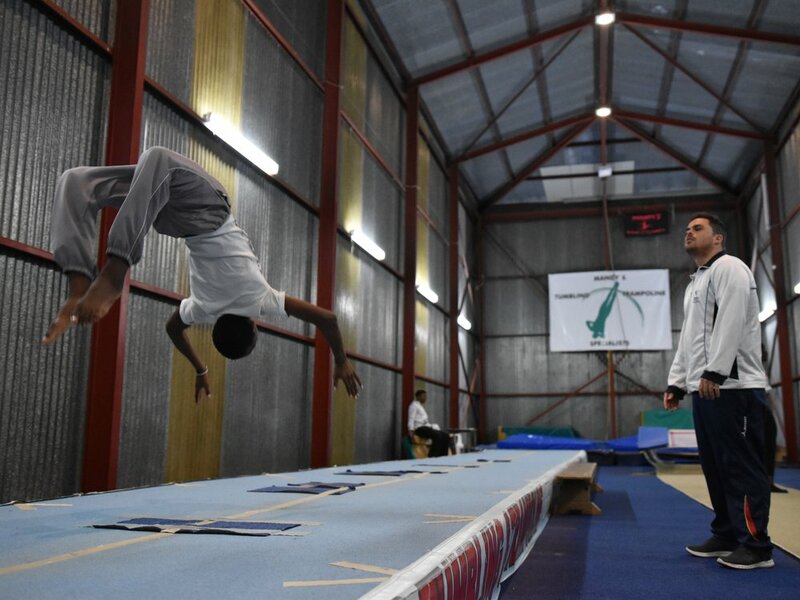 Every day he did two sessions with our five international gymnasts, one session with our competitive gymnasts and an open session for anybody who wanted to try. We did lots of new moves. Three of our gymnasts did for the first time a miller: a double flip with three twists! 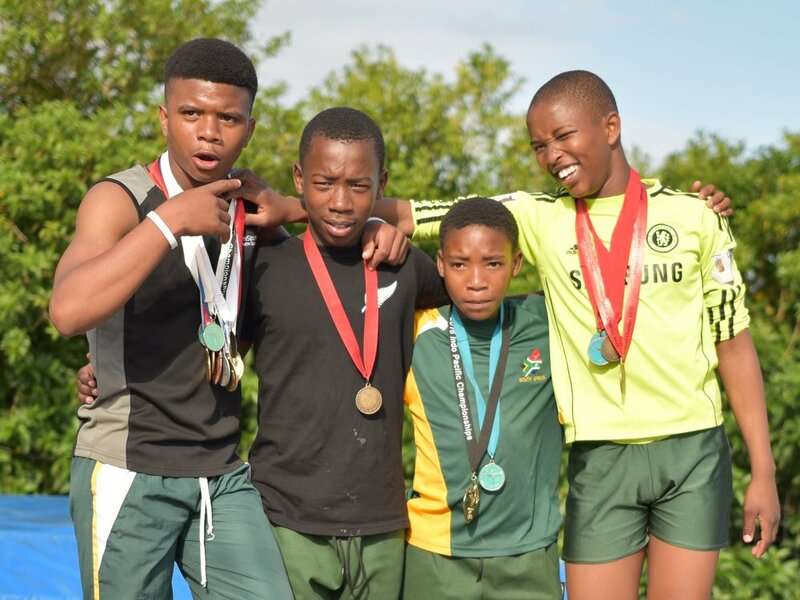 The camp was sponsored by the Eastern Cape Academy of Sport. 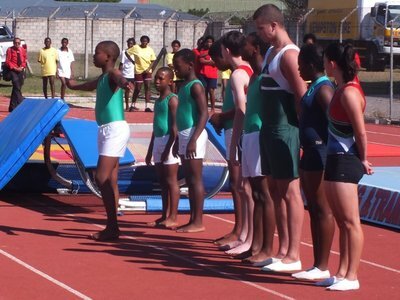 The first Eastern Cape Trials for National Championships took place in Port Elizabeth and Uitenhage. It was also trials for African Champs. Nemato had a strong team that won many medals and impressed everybody with its performance. We also had some young new gymnasts winning medals. 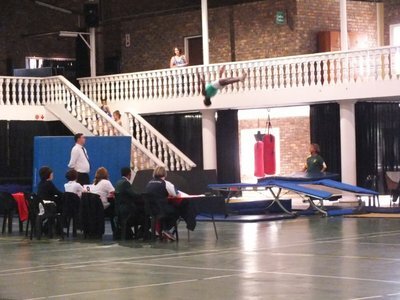 In the pictures the tumbling competition in Port Elizabeth on Friday. We win medals in tumbling and we don't even have a tumbling track! 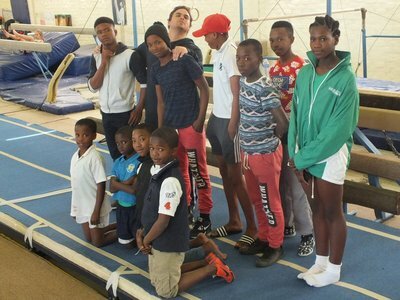 The Eastern Cape Academy of Sport invited our top gymnasts for a show during the launch of their Mobile Sports Coach programme in Port Elizabeth. 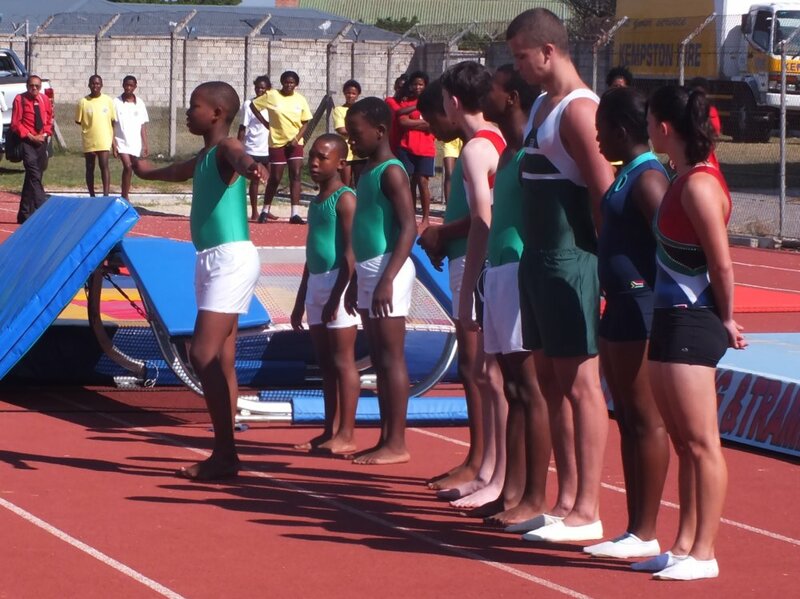 It was a show by the top gymnasts for our club and Mandy's club from Port Elizabeth. The event was attended by dignitaries like the provincial Minister of Sport. The gymnastics show was the highlight of the event. 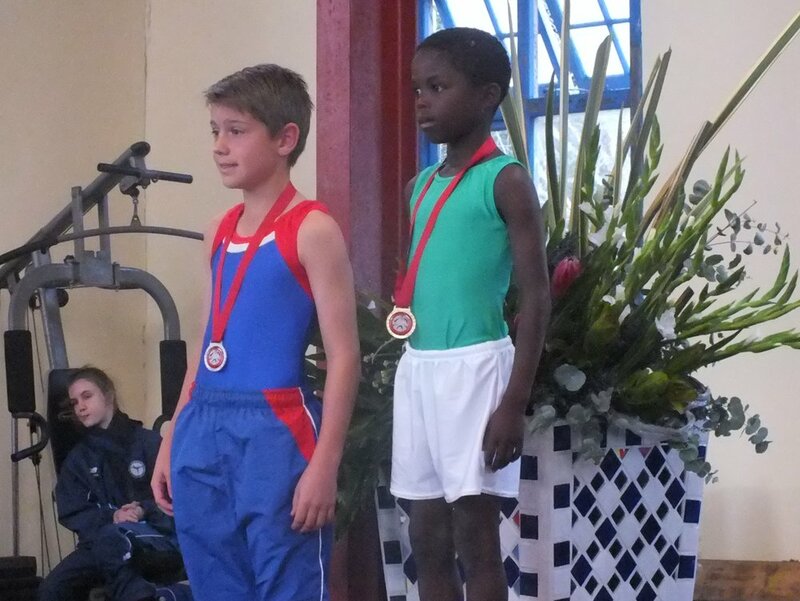 Two Nemato gymnasts were selected for the Top Ten competition in Pretoria: Onke Mangele and Khanyile Mbolebwa. 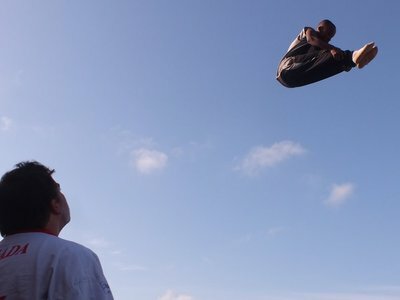 It was combined with trials for African Championships and for Indo Pacific Championships in New Zealand. We went with five of our international gymnasts. The guys did very well, but only after the second trials later in the year we'll know who qualifies. 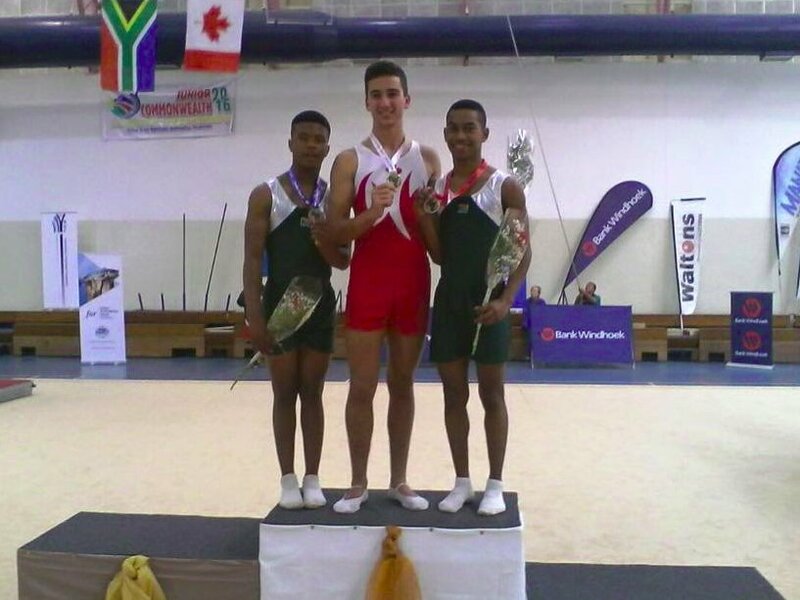 In the Top Ten competition Onke was again the best of all South African junior gymnasts on double-mini trampoline and he took the gold medal home. In all the years Nemato Gymnastics Club never had club leotards. We were using some very old second hand leotards that were not in our club colours white. Often at competitions we were stuck with too many gymnasts competing at the same time, leaving us with not enough leotards for all. A generous donor turned it all around for us. We now have brand new leotards in our green and white, and we have enough to keep us going for years. A great thanks to our donor!